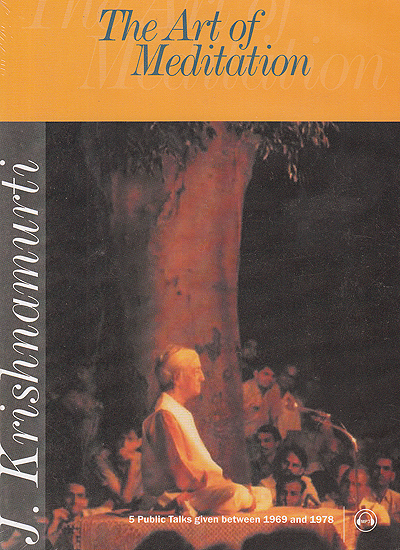 Unlike most other religious teachers Krishnamurti does not offer a method of meditation. On the contrary he states categorically that meditation is not a practice a system of prayer or the reprtition of a mantra. It is not learning how to concentrate or how to control thoughts nor is it a spiritual exercise undertaken at set times every day. Meditation is a part of ordinary existence a state of awareness with which one meets life. Meditation is not something different from daily life do not go off into the comer of a room and meditate for ten minutes then come out of it and be a butcher both metaphorically and actually. When you have a system of meditation it is no longer meditation. It is just mechanical repetition and that has no meaning whatsoever. Pursue each thought therefore there is no contradiction no resistance about any thought. Then from that arises awareness. Meditation in daily life is the transformation of the mind a psychological revolution so that we live a daily life not in theory not as an ideal but in every movement of our life in which there is compassion love and the energy to transcend all the pettiness of the life one leads. There is silence between two thoughts there is silence when thought says I must be silent all those are artificial silenced not real deep, uncultivated unpremeditated silence.